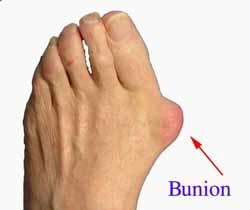 The main sign of a bunion is the big toe pointing towards the other toes on the same foot, which may force the foot bone attached to it (the first metatarsal) to stick outwards. Other symptoms may include a swollen, bony bump on the outside edge of your foot, pain and swelling over your big toe joint that's made worse by pressure from wearing shoes, hard, callused and red skin caused by your big toe and second toe overlapping, sore skin over the top of the bunion, changes to the shape of your foot, making it difficult to find shoes that fit. These symptoms can sometimes get worse if the bunion is left untreated, so it's best to see a GP. They'll ask you about your symptoms and examine your foot. In some cases, an X-ray may be recommended to assess the severity of your bunion. Anyone can develop a bunion, but they're more common in women than men. This may be because of the style of footwear that women wear.